DYLM | What Does DYLM Mean? 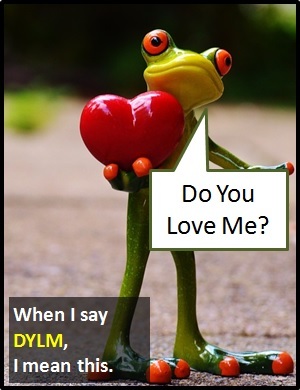 DYLM means "Do You Love Me?". The abbreviation DYLM is a way of asking someone what their feelings are towards you. It can also mean "Do you like me? ", which is the same sort of question but looking for clarification of a less intense emotion. Of interest, "Do You Love Me?" was a 1962 single recorded by The Contours, written and produced by Motown CEO Berry Gordy Jnr. The British group The Tremeloes covered the track in 1963 and spent three weeks at No. 1. "Do you love (or like) me?" Ray: Depends whether you mean "love" or "like". Sasha: We've been going out for three weeks now. Leon: Three weeks and five hours. DYLM yet? Sasha: Err. Well, I like you. DYLM plays the role of an interrogative sentence (i.e., a question), but it is commonly seen without a question mark. In other words, it can be written "DYLM?" or "DYLM". Definition: Do You Like Me?